OH37 transomed a simple stand into an experience that embraced the customer journey, and guided visitors through a personal space where they could share in a breath of life. 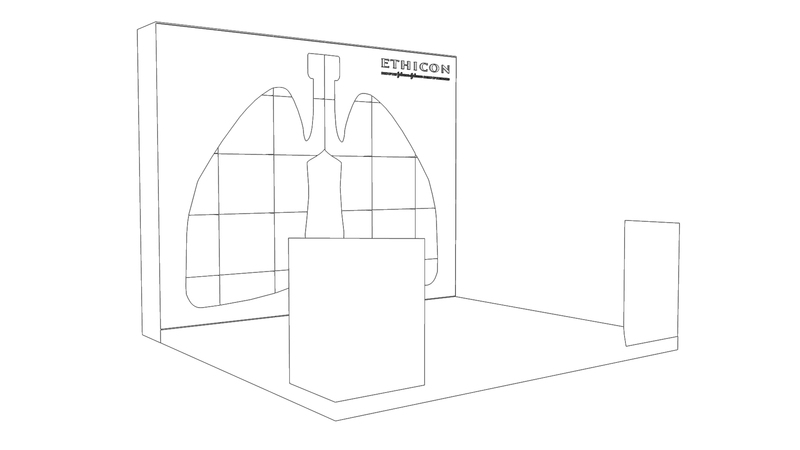 Johnson & Johnson (JnJ) Ethicon needed a stand for the Innovation Conference in Thoracic Diseases at Cleveland Clinic Abu Dhabi, with the marketing goal of promoting two devices used for Thoracic Surgery. OH37’s main aim was to hold visitors attention and focus them on the products JnJ Ethicon was promoting. We faced several creative challenges, one of which was to avoid depicting cancerous tumors. 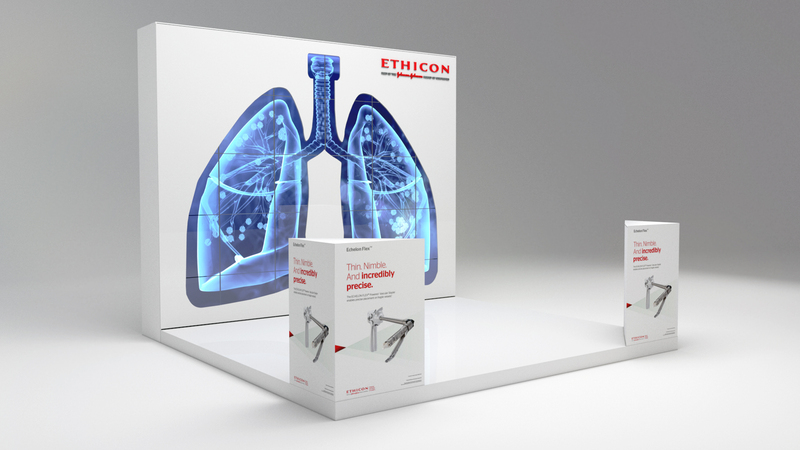 We also had to clearly portray that Ethicon’s devices are used for thoracic surgery. To capture the direct benefit that the tools provide, the idea was to design healthy, breathing lungs and bring them to life through animation. To enhance attention to the breathing lungs were formed on 3m x 3m LED screen that formed the back wall of the stand. Fitting within a tight space, and successfully implemented within the allocated time frame. The screen was then cladded with a wooden outline of the lungs, masking the screens and focusing the attention to give the viewer a realistic 3D effect to the lungs. Once animated, the back wall appeared to be breathing hence creating a direct association to the benefit of the Ethicon devices used for Thoracic Surgery. A futuristic stand for medical tools that comes to life and celebrates the brand benefits. The custom-made animated experience draws the visitors closer to the center of the stand where two videos play within the structure of the lungs. This gave visitors an in-depth look at each of the machines and product features. Simultaneously, JnJ representatives would physically demonstrate the devices on visitors to better explain the product features. The stand and product display were both a social and interactive brand experience. The reception to the project was astounding. The JnJ – Ethicon Breathing stand stood out over all the conference competitors and the installation; its detailed design and production; placed JnJ in a dominant position that brought a tremendous amount of interest and footfall.